You’ll need replacement screens and o-rings – available from Storz & Bickel. At $28.90 the SOLID VALVE Wear & tear set is a great deal, it includes all wear & tear parts; 1 pc. o-ring set, 1 pc. normal screen set, 1 pc. balloon tube set (3 pcs. x 3m), 1 brush. UPDATE: I recommend using a glass jar to avoid any possibility of plastic leaching into your wash. I don’t think you’ll damage the chamber, maybe wear the rubber o-ring out faster. The real reason you don’t leave the chamber on is that as it sits there your herb continues to cook, and may even be slowly vaping away. Even without the fan on, there’s quite a bit of heat there. The metal of the chamber absorbs the heat, and continues to heat your herb. No ridicule deserved! Onward and upward! Help! I bought a used classic volcano with the easy valve connection and the first time we used it we noticed that there was material inside the bag. Why is this happening and how do we stop it from continuing? ? Sounds like it’s dirty. Take that thing apart and clean it good! I have a digital volcano and when trying to clean it, the part that attaches to the balloon doesn’t disassemble. In the video, it comes out rather easily, but the metal cylindrical part doesn’t seem to come out like the video. Is this normal or is there something i’m missing? If you mean the herb chamber, the Easy Valve pushes out rather than unscrewing. Clean the parts in boiling milk. big mug of milk, pyrex jug, microwave, bring to boil, drop parts in, swish around. When cooled a bit pour through a sieve into bowl/jug. Zap that, repeat a few times. Most falls off, little rub takes rest off. Rinse with tap water. Make milk into a hot chocolate. Thanks for the great video! Only question is: if you have an Easy Valve Volcano, how much of this applies? Do you have any resources/videos on how to clean the Easy Valve version? It seems like most of this was cleaning the mouthpiece of the solid valve. With the Easy Valve, wouldn’t all you have to clean would be the herb chamber and the air filter on the bottom? Is there anything inside the volcano (looking down at it from the top) that you need to clean? Hi, I have got a problem. I am probably too much worried about my volcano, but today it fell down from my table, and I am not sure whether it was like this before, but now if I shake it seems like something is slightly moving inside. Is it normal? I have got a digit version, so if there is anyone who have one please try to shake it and tell me. If it still works, I would not worry too much. If it bothers you, I would check with Storz and Bickel. I have a Classic which fell hard enough to get dented. That was 4 years ago and it’s still going strong! What purpose does the yellow gasket serve on the herb chamber? I think it provides a little bit of grip, and a nice decorative touch? My fan just stopped working but the heating element is fine. Is there any way to get it up and running again? Been using for years, save all oil, its pure THC. Scrape what you can, smoke it in a pipe or bong, use alcohol (99%) to soak and clean other parts, then evaporate. I remove and burn screens with small torch, dip in glass of water while red hot and they come out like new. Do not use compressed air, use vacuum for the big screen on the top of the volcano itself. I never want to go 24 hours without my volcano, no simple green for me. Nice video. How often do you clean it? Thank you for your reply. Can you be a bit more specific please? Lets say that I use it twice per day. Do I clean it every week? I’ve never had to clean it every week, maybe every 2 or 3. You’ll know it’s time to clean because the parts will get gummed up and not work as well as normal. The top screen of the filling chamber is a good indicator. I use my vacuum. You could also use canned or compressed air to blow it out. thanks for the swift reply… is it smart to us the compressed ait to blow it down into the vape…or shall i remove the silver cover and expel everything upward? If I were using compressed air, I’d try and blow accross rather than into the screen. I think the vacuum is the way to go. I forgot to mention, I often just turn the thing over and give it a firm whack on the bottom. You’d be amazed how much dust can come out. haha prefect…i will try the upside down tap…i was a little skepticle at first… i dont want to bang anything loose in there. Thanks for the help…this website is great for Volcano Users. 2 things. I forgoe the salt, and just use alcohol. so I can evap the alcohol and harvest oil. Also I tried the aclohol bath on my storz grinder and it started leaching mad plastic. Turned real hazy and cloudy. That plactic makes its way into your oil if you save the alcohol. Plastic is no good for the lungs. Even expensive plastic. Thank You SO much! These things are (quite) expensive and the retailers are in the dark as to how to use them, clean them etc….You really helped! Seems to me that you’re discarding valuable essence when you just dump the rubbing alcohol. Me, I save it in a shot-glass and put it aside. After the alcohol evaporates, you’re left with a very pure oil that you can either vape or add to butter. Discarding it entirely seems foolish to this user! I also use zip-ties for the end of the bag- the plastic ties are a pain. OH MY GOD you didn’t scrape anything with a straw before washing! The resin inside the Volcano is PURE HONEY OIL! Just use a straw! Smear it on a paper or smoke it with a glass hotknife & torch. Also, I always just use Citrusolve (a citrus based solvent) to clean our Volcano, can wash everything together. Also, an old toothbrush for the hard to reach parts. I scrape the inside of my chamber regularly (wooden toothpick) and mix it in with the fresh as I load the Volcano. I’m not one for combustion so that’s the best way to use it I’ve found. I’ve always wondered though – how good can the oil really be if it’s been exposed to so much high temp? Really good! Gets me right whenever we run out lol. 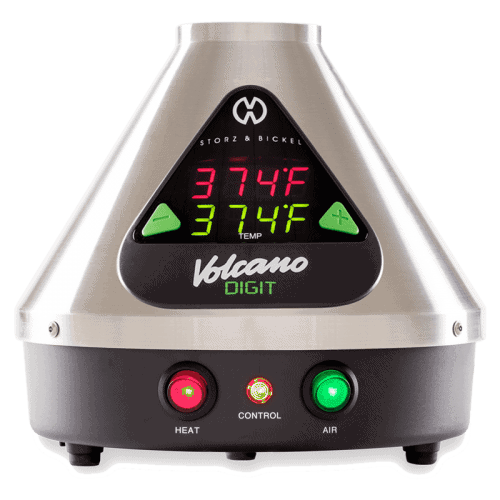 The Oil requires a higher temperature than what u would normally use with the volcano system, so it should be pretty good. Mike – if you like, email pics to vapormaster[**at**]volcanotips.com and I’ll post them here for all to see. Thanks for sharing. you will worship me every time you use it. it only requires hot water (it has built in heater) and hand dishwashing detergent. I will not waste words because there are none that describe the feeling of a miracle that you will experience the first time you use it. It is sold through many outlets and even on ebay under different brands, but I would recommend getting this specific model just because of how much it impressed me with the results. AWESOME video – thank you it helped me a ton and clarified the whole process…great for the visual learners! If you dry run (empty the chamber) the valve through the vaporizer you will warm the pieces and resins in the chamber. This will make it easier to remove the tamper and metal insert! Don’t run it too long (over 60 seconds); you still need it to be cool enough to handle.